Get there quickly, if you can. Before cleaning microfiber couch stains, it is exceedingly important for you to try to find the care instructions that came with the couch. Technology has done it again. The geeks of the world have united to bring us yet another fantastic product designed to confuse the hell out of us when it comes to cleaning said product. Due to the increased number of applications in which microfiber is being used (furniture, towels, rags, cleaning products, etc. ), the question of how to clean microfiber is being raised more and more often. But you know what? This is a good problem to have. Turns out, the increasing popularity of microfiber is well-justified. The stuff is extremely durable, holds its color well, is nice and soft, and has all the liquid-repelling properties of a duck. For these reasons, microfiber use has moved quickly from the garage to the living room. And while it’s somewhat acceptable to have stained microfiber cloths out in the shop, it’s a whole different story when the microfiber upholstery on your new couch starts to get stained up. And get stained up it will. Microfiber couches are, as advertised, really good at repelling stains. However, as you’ve undoubtedly learned, they are not nearly as “stain proof” as they claim to be. 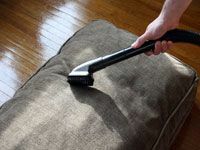 The bulk of this article will focus on how to clean a microfiber couch or chair. It doesn’t stop there, though. If you’re looking to learn about cleaning microfiber cloths like towels, rags or clothing, I’ve got you covered there too. 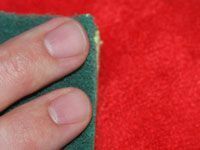 Just wander down to the bottom section of this article for a quick, precise tutorial on how to clean microfiber cloth. Get there quickly, if you can. When it comes to cleaning microfiber furniture, the best thing you can do is to get to the spill quickly. The moment it happens, grab a plain white terrycloth towel or white paper towel and blot up as much of the spill as possible. Oftentimes, since fluids tend to bead up on the stuff, this is all you will need to do to clean microfiber. If something goopy was spilled or dropped onto it, being careful not to rub it in, use your paper towels to wipe off as much as possible. If your spill was a liquid and had been there for awhile by the time you found it, carry on to the next step. If it was goopy and had been there for awhile, and is now dry, gently scrape as much of it off as you can with the edge of a spoon, vacuum off the chunks, and carry on to the next step. Before cleaning microfiber couch stains, it is exceedingly important for you to try to find the care instructions that came with the couch. 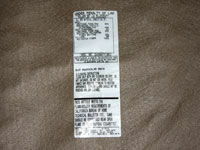 These are oftentimes found on one of the couch cushions or sewn onto the surface beneath them. If they are not found on the couch, that means they are in the pamphlet that came with your couch. And that means they’re lost. If you do happen to find the instructions, ignore this article and do as they say. Chances are, they will come with a super secret code that tells you what to use for washing microfiber. The code is actually pretty simple. It will say “S” for solvent-based cleaner, “W” for water-based cleaner, or “SW” for either. Any furniture store can give you appropriate suggestions for a good cleaner. If, however, you were unable to unearth the aforementioned pamphlet, you might consider moving on to the third step for how to wash microfiber. Wash microfiber. Alright, the time has come to get down and dirty with cleaning microfiber sofa stains. Start by making your own homemade microfiber cleaner. Brace yourself, this is gonna be rough. Pour two cups of room temperature distilled water into a bowl, and gently stir in two tablespoons of a clear dish soap such as Seventh Generation. Whew! Made it. Now get yourself a sponge, dip it into your microfiber cleaner, squeeze it out really well, and start working the stain from the outside to the inside. This way you won’t spread the stain. Re-dip and squeeze the sponge as necessary and continue until the spot is gone. Before cleaning microfiber with this method, I urge you to first try it on an inconspicuous area of the furniture just to make sure no discoloration or disfiguration will occur. Rinse the microfiber. Now that you know how to clean microfiber couch stains, and have done so, you’ll want to get as much of the residual soap off as possible. Happily, this step of the microfiber cleaning process is pretty easy. 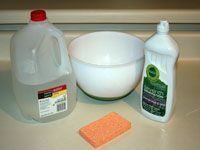 All you have to do is grab a clean new sponge, pour some fresh distilled water in a clean bowl, dip the sponge in it, squeeze it out as before, and wipe the spot down where you cleaned. Do this several times and rinse the sponge between each. Always make sure to use distilled water for washing and rinsing. It is pure H2O and won’t leave water spots like regular tap water will. And with microfiber’s affinity for water spotting, this is very important. Drying microfiber. Hey! You made it! Congratulations. So you’re all done cleaning microfiber. 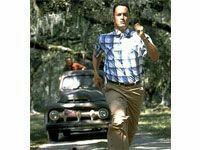 Only one thing left to do. Dry microfiber. Luckily, if you feel like it, you can do this quite passively and just let it air dry. However, if you’re impatient, you can take a proactive approach and hit it with a blow dryer for a little bit. If you do use the blow dryer method, make sure to do it on cool. Since microfiber is generally made of polyester, nylon, or both, heat can quite easily damage it. Once your microfiber is dry, it might feel kinda hard and crunchy. To fix this, just run a suede brush gently over it a few times. This will restore the nap and return it to softness. Preventative measures. If you want to avoid having to reacquaint yourself with this information on how to clean microfiber sofa stains, I have a few suggestions for you. First off, start vacuuming your microfiber furniture once a week or at least twice a month. This will help you avoid stains by removing crumbs that might otherwise get ground into the fabric. While you’re at it, institute a “no eating” policy for on the couch. At the very least, if you’re gonna sit there while you eat, lay a towel down first. Finally, and I know this may be an unpopular idea, but consider training pets to stay off the couch. There are a couple different ways to clean microfiber towels, both of which are pretty simple. The most important thing to remember when washing microfiber is to avoid heat. As I’ve mentioned, microfiber is a synthetic material that is quite easily melted or disfigured by high temperatures. The first method starts with gathering all of your dirty microfiber rags or towels that need cleaning. Once they’re gathered, fill a bucket with enough lukewarm water to easily cover them once they’re placed inside. Next, put three to five tablespoons (make your own judgment based on the number of rags and extent to which they’re soiled) of a clear liquid dish soap or laundry detergent and stir it in gently. 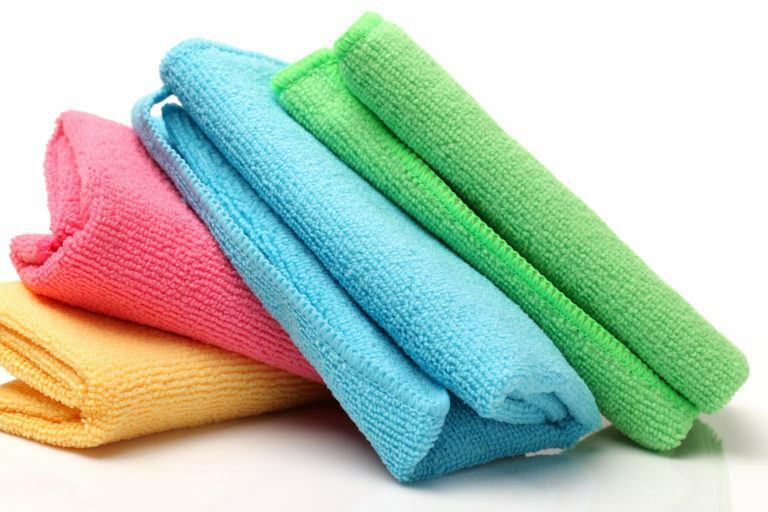 Once your microfiber cleaner is all mixed up, submerge all dirty towels and let them soak for at least an hour. After the soak, agitate them manually and gently rub them together to dislodge dirt and grease. When clean, rinse them thoroughly with lukewarm water in either the sink or in a bucket of fresh, clean water. Hang them to dry. The second method is to toss them in the washing machine. Wash them in the delicate cycle with cold water. Always use clear liquid laundry detergent. The hoops and hooks that are weaved into microfiber will grab and hold on to grains of powder detergent. They will also hold on to and trap lint from other types of fabrics, so make sure to wash microfiber alone. While the best method for drying microfiber is to hang it, you can also put it in the dryer if, and only if, your dryer has an air fluff setting. Remember, heat can destroy microfiber. Rubbing alcohol. For a little extra oomph when cleaning microfiber with bad or greasy stains, plain old rubbing alcohol can work wonders. 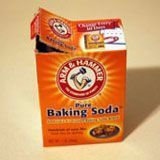 Simply fill a small squirt bottle with the stuff, spray it onto your greasy stain, and wipe away your troubles with a clean sponge or white cloth. Test first for colorfastness in an inconspicuous area of the couch with a cotton swab dipped in the alcohol. White vinegar.Accidents sometimes happen. If a pet, kid, or drunken roommate left a special little puddle on your microfiber couch, spray it down with a little white vinegar. Don’t saturate, just get it damp. 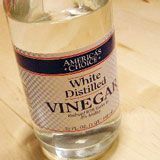 Vinegar is fantastic for removing unwanted odors. Keep in mind that, since you shouldn’t saturate the sofa, you may need to do this a couple times. Allow it to dry thoroughly between applications. 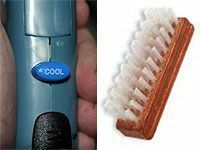 Once you’re satisfied and everything is dry, go over the now-crunchy spot with an old soft toothbrush or a suede brush to make it soft again. You can get it pretty much anywhere, or order the vinegar straight from Amazon. Vodka. 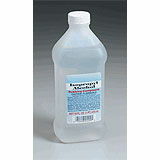 Use vodka in the same manner as you would rubbing alcohol (see above). I know it seems a waste, but it is said to work very well. My only suggestion is to not use the good stuff. 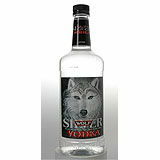 Pull out that bottle of Silver Wolf you’ve had since college, take one last swig for old times’ sake, pour a little on the ground for your fallen homies, and set to work. Baking soda. If your microfiber sofa is starting to get a little smelly, be it from pets, kids, body odor, or just plain old mustiness, sprinkle some baking soda on it. Spread it all over the seats, armrests, backrest, and wherever else you can get to. Allow it to sit on the couch for a good half an hour and then vacuum it off.